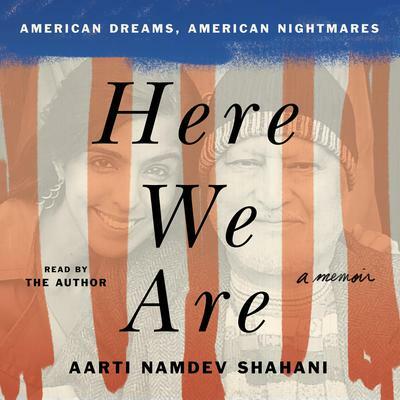 Aarti Namdev Shahani is the author of memoir Here We Are: American Dreams, American Nightmares. She is a correspondent for NPR based in Silicon Valley, covering the largest companies on earth. Her reporting has received awards from the Society of Professional Journalists, a regional Edward R. Murrow Award, and an Investigative Reporters & Editors Award. Before journalism, Shahani was a community organizer in New York City, helping prisoners and families facing deportation. Her activism was honored by the Union Square Awards and Legal Aid Society. She received a Master's in Public Policy from the Harvard Kennedy School of Government, with generous support from the university and the Paul and Daisy Soros Fellowship for New Americans. She completed her bachelor's degree in anthropology at the University of Chicago. She was among the youngest recipients of the Charles H. Revson Fellowship at Columbia University and is an alumna of A Better Chance, Inc. Shahani grew up in Flushing, Queens—in one of the most diverse zip codes in the country—and believes every American should visit her hometown to understand what makes America great.